The Democratic front-runner has apparently been persuaded to agree to tell the world what the US Government knows about UFOs if she gets to the White House. Hillary Clinton is fast becoming the Democratic Party’s front-runner for the US presidential election, but is seems her destiny may have been written in the stars. Campaign chairman John Podesta says he has “convinced” her to tell the world about the UFO/ET phenomenon. The long-term advocate of ending excessive secrecy seems to have struck a chord with his boss who has pledged to “get to the bottom of it” and “have a task force go to Area 51” – the military base where America test flies its top secret aircraft. 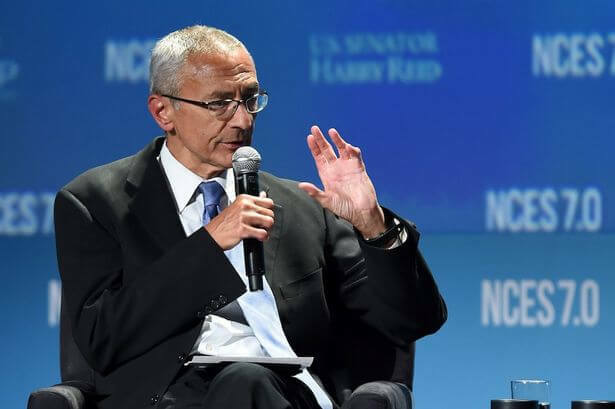 Podesta, who has been an advisor to US presidents Bill Clinton and Barack Obama since 1993, says the former First Lady has listened to his pleas for all government-held UFO files to be made readily available to the public. During an interview with Steve Sebelius, co-host of KLAS-TV Politics Now, based in Las Vegas, he said: “I’ve talked to Hillary about that. “I think I’ve convinced her that we need an effort to declassify as much as we can so people can have their legitimate questions answered. It is not the first time the former White House Chief of Staff has called for the US government to come clean on what it knows about aliens. In 2010 he wrote the foreword to journalist Leslie Kean’s seminal work UFOs: Generals, Pilots and Government Officials Go on the Record, with the earth-shattering statement: “It’s time to find out what the truth really is that’s out there. And he has also called for the release of government-held UFO files in 2002 and 2003 at the National Press Club in Washington DC. While her main political rivals have avoided the subject, such as Bernie Sanders and Donald Trump, Clinton’s chief spin doctor has actively encouraged journalists to ask her questions on the ET issue. Clinton, who looks set to take on Republican favourite Trump in the November election, admitted to journalist Daymond Steer, of the Conway Daily Sun in December 2015, that she would “get to the bottom” of UFO/ET issue. She said she would “have, like, a task force go to Area 51” – the first time a presidential candidate has used the UFO/ET issue as a vote winner. While her husband Bill was president, between 1993 and 1996, he was approached by billionaire Laurance Rockefeller to release UFO files to the public as part of the ‘Rockefeller Initiative’. Hillary was even photographed at the philanthropist’s ranch clutching a copy of a book entitled Are We Alone? : Philosophical Implications of the Discovery of Extraterrestrial Life by respected American physicist Paul Davies in 1995.